How white people justified and struggled with separating slave families. How white Americans constructed a fictitious distinction between white and black emotions. A slave auction in the South, from an original sketch by Theodore R. Davis. 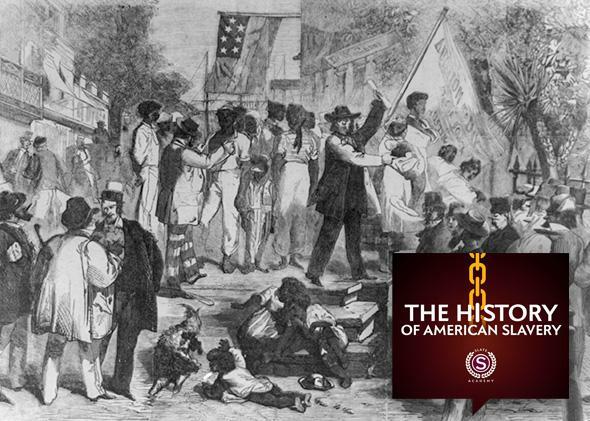 This article supplements Episode 3 of the History of American Slavery, our inaugural Slate Academy. Please join Slate’s Jamelle Bouie and Rebecca Onion for a different kind of summer school. To learn more and to enroll, visit Slate.com/Academy. Excerpted from Help Me to Find My People: The African American Search for Family Lost in Slavery by Heather Andrea Williams. Published by The University of North Carolina Press. Their griefs are transient. Those numberless afflictions, which render it doubtful whether Heaven has given life to us in mercy or in wrath, are less felt, and sooner forgotten with them. In general, their existence appears to participate more of sensation than reflection. There was certainly no monolithic white response to the separation of slave families. Certainly white abolitionists abhorred slavery, and many agreed with Harriet Beecher Stowe that family separation was one of its most repulsive features; but even some of them questioned black people’s ability to feel deeply. It is fair to say that most white people had been so acculturated to view black people as different from them that they did not perceive the existence of slavery in America as a problem, and when exposed to slaves, they barely noticed the pain that they experienced. These whites compartmentalized their lives and experiences, putting themselves and other whites into one sphere and enslaved people or even free black people into another. It did not even occur to them that emotions experienced in the white sphere could also be experienced by the enslaved people. Sarah Brownrigg Sparkman, for example, could listen to the 91 enslaved people she took to Mississippi express their concerns about leaving their loved ones behind yet speak of them as being cheerful, childlike, and without a care. She did not layer their concern and anxiety over their curiosity and awe; instead she saw only one dimension. When she wrote of the enslaved people singing into the night even though they had to walk for miles the next day, she did not consider whether, as Frederick Douglass believed, “The songs of the slave represent the sorrows of his heart and is relieved by them, only as an aching heart is relieved by its tears.” She could not see that the slaves who sang together at night may have done so in part to soothe themselves and to hold their community together. She also did not seem to notice if some people were too sad to participate in the singing, or whether Rose had wandered off alone to grieve for her husband, whom she had left behind in North Carolina. These details eluded Sparkman even as she wrote about missing her own relatives; she was able to see only simple-minded people who were able to walk all day and stay up all night enjoying themselves. Without even thinking about it, white Americans created compartments and erected boundaries that walled off their emotions from the emotions of enslaved people. Some, such as Thomas Jefferson and Thomas Cobb, postulated about the relative capacity of blacks and whites to experience emotion, but others operated on the unexamined, and perhaps only semiconscious, assumption that they were more sensitive souls than were enslaved people, and likely all black people. This sensibility was evident in Sparkman’s letter. This is how slavery was able to flourish for more than 250 years in a country where white people avowed a love of liberty and equality of human beings. These daily encounters in which whites ignored or denied the feelings of enslaved people but counted their own feelings as special and significant derived from and shored up a society in which sharp lines could be drawn between blacks and whites. The conscious machinations of statesmen and intellectuals blended with the passive acceptance of the status quo by ordinary whites to extend and prolong the institution they had created and from which most benefited directly or indirectly. The apparent indifference, contentment, and even enjoyment that some whites perceived in enslaved people as they faced sale and family separation contrasts starkly with the descriptions of former slaves who saw wrenching scenes of separation in the slave market. How are we to understand the differences? It is possible that even when they felt pain, some enslaved people did not reveal it and that some whites were eager to believe in the appearance of contentment as the only reality. It took a particularly discerning white person to realize that black people were not transparent, that they sometimes held their true ideas and sentiments closely. The real sentiments and feelings of the negroes, in respect to their situation, it is very difficult for any white person to ascertain, and for a stranger, it is nearly impossible. They regard the white man as of a different race from themselves, and as having views, feelings and interests which prevent his sympathizing fully with theirs. Distrust, even of their real friends, is no unnatural consequence of the relation which they and their ancestors have so long borne to the whites. When therefore a white man approaches them with inquiries concerning their condition, they are at once put upon their guard, and either make indefinite vague replies, or directly contradict their real sentiments. Enslaved people carried with them a range of mechanisms for coping with their circumstances and the anguish that derived from their inability to control their lives. Some people held their tongues. Some plastered their faces with the grins that traders demanded. Many were silenced by their pain and their outrage, and they stifled their grief. Some people, though, would not be quieted and could not be comforted. And once in a while, their wrenching wails pierced the walls that white people constructed between themselves and the pain of black people. Austin Bearse, a white man from Massachusetts, was present when a black woman disturbed the peace and broke down the walls. Bearse worked on a Massachusetts-based ship that transported enslaved people from Charleston to New Orleans. The ship sometimes transported as many as 80 people to plantations in New Orleans. Before setting out, Bearse said, “We used to allow the relatives and friends of the slaves to come on board and stay all night with their friends before the vessel sailed. In the morning it used to be my business to pull off the hatches and warn them that it was time to separate, and the shrieks and cries at these times were enough to make anybody’s heart ache.” After 12 years of hearing these cries, Bearse had become inured to them, but one woman managed to get through. Some slave owners knew that black people had feelings. They knew that they grieved, so they hid from them and their grief and anger while attempting to diminish the profundity of the people’s pain because they did not want to see it or face it or feel it. If they did, they might not be able to continue to hold people as slaves or to sell them away from their families. If they acknowledged that these black people were people just like them, who hurt as they did when they lost their loved ones, and if they faced them in their grief, then they might not be able to live with themselves. Others who participated in the slave trade demonstrated even less concern. Sometimes it took the desperate screams of a disconsolate mother to penetrate their consciousness, trigger their empathy, and break their silence. White people had the capacity but not always the will to care. It took insight and courage for a white individual to challenge the privileges and seeming naturalness of white superiority. It took strength of character and risk of ostracism and violence to reject the notion that blacks had lesser feelings and were intended for white exploitation. It took commitment to empathize. As in most societies in most times, it was easy in the mid-19th century to avoid examining accepted ideas that held currency in the society and had been passed down from one generation to the next. Indeed, most whites in the North and certainly in the South did not even question their assumptions of black inferiority and suitability for slavery. For those who did think about the assumptions and who allowed the reality of other people’s pain to enter their awareness, it took courage to turn their backs on slavery. It took courage and a moral commitment to quit the slave trade and wage a struggle for the eradication of slavery, as Austin Bearse did, or to release slaves and move out of the South, as many Quakers did in the 18th and 19th centuries. It took courage, but it was nonetheless possible for white people to see and hear and acknowledge the grief of enslaved people as they lost their families. It was always possible to choose to walk away from slavery and the destruction that it wrought. 1Frederick Douglass, Narrative of the Life of Frederick Douglass, ed. David W. Blight (New York: Bedford Books, 1993), 14–15. Walter Johnson suggests that the songs enslaved people sang on coffles were memorials to the communities that the slave trade destroyed; see Johnson, Soul by Soul, 69. See also George M. Fredrickson, The Black Image in the White Mind: The Debate on Afro-American Character and Destiny, 1817–1914 (Hanover, N.H.: University Press of New England, 1971), 57–58. 2Ethan Allen Andrews, Slavery and the Domestic Slave Trade in the United States (New York: Books for Libraries Press, 1971) 97, 135. Andrews prepared his series of letters from the South for the American Union for the Relief and Improvement of the Colored Race. 3Austin Bearse, Reminiscences of Fugitive-Slave Law Days in Boston (Boston, 1880), 8–9.